Born September 2, 1910, in Mexborough, South Yorkshire, England, Donald Watson coined the term “vegan” to describe individuals who abstain from the consumption and use of animal products and founded the Vegan Society to promote this idea. Watson spent much of his life as a woodworker or teaching woodwork. His father was a headmaster of a nearby school. His uncle and grandmother ran the family farm, and, at an early age, Watson, who had thought of the farm as an idyllic place, witnessed the slaughter of a pig. This began his reassessment of the human-nonhuman relationship, which continued through Watson’s adolescence. In 1924, at age 14, Watson became a vegetarian. Twenty years later, in 1944, he founded the Vegan Society, although he had already been practicing a vegan diet and lifestyle for a few years prior. “Vegan” comes from the beginning and ending letters of the word “vegetarian.” Watson thought that veganism was the logical conclusion of rejecting animal products for reasons of morality and health. He maintained that dairy products, such as milk and cheese, and eggs, were every bit as cruel and exploitive of sentient animal life as was slaughtering animals for their flesh: “The unquestionable cruelty associated with the production of dairy produce has made it clear that lacto-vegetarianism is but a half-way house between flesh-eating and a truly humane, civilised diet, and we think, therefore, that during our life on earth we should try to evolve sufficiently to make the ‘full journey. '” He also avoided wearing leather, wool, or silk and used a fork, rather than a spade, in his gardening to avoid killing worms. Watson was opposed to hunting, fishing, blood sports, and the use of animals in experiments or for testing purposes. Although he claimed to have respect for those who liberated animals from laboratories or engaged in other forms of direct action, he expressed concern that such activities were counterproductive. He was an advocate of organic farming and was critical of genetic modification of plants and animals. Watson touted and exemplified the health benefits of a vegan diet, but he clearly saw veganism primarily as a moral principle. He regarded the vegan movement as “the greatest movement that ever was” because it provided a solution to the crisis of greed and violence that affected and afflicted humankind and that threatened ecological disaster. Although he was not religious in a traditional sense, he had deeply held spiritual beliefs that included the idea that being a carnivore violated natural law and that violence against nonhuman animals was a violation of spiritual laws that brought psychological unhappiness and ill health. Watson maintained that compassion was the only useful part of religion and that veganism involved practicing compassion. Watson was committed to nonviolence in general. He had objector status during World War II. He lived an active and healthy life until his death in 2005 at age 95. Watson predicted, as did playwright George Bernard Shaw about his own funeral, that it would be attended by “all the spirits of all the animals” that Watson had never eaten. I hope that my profound respect for Watson, and his progressive vision, is apparent even from this brief entry. I wrote this entry on Watson in 2010. In 2011, I was actually banned from the Vegan Society’s Forum because I was promoting veganism after I started a discussion you can read here. Semple, who joined the charity in October 2012, knew she had a serious problem to solve. Not only was the visibility of the charity low – among the public as well as journalists – but the branding and identity no longer reflected its aims. Rather than existing solely to provide information to help individuals become vegans, the society now wants to engage with policy-makers at a higher level on a wider range of issues, such as international development and climate change. Nevertheless, she went ahead with the project, drawing on pre-existing academic research examining the portrayal of vegans in the media – typically, says Semple, they were seen as ascetics or faddists – and analysing the 2013 membership database, which found the average age of members was 56. “We realised that we needed to attract the next generation and find out what they wanted,” Semple says. And what is that “pre-existing academic research” to which Semple refers? It is one study: M. Cole and K. Morgan, Vegaphobia: derogatory discourses of veganism and the reproduction of speciesism in UK national newspapers, British Journal of Sociology 2011 Volume 62 Issue 1. And what does that one study say? It says that newspapers in Britain portray vegans and veganism in derogatory ways–as “ascetics, faddists, sentimentalists, or, in some cases, hostile extremists”–in order to perpetuate speciesism and to disconnect discussions of veganism from the moral and ethical issues presented by animal exploitation. Is that any surprise? Any surprise at all? Newspapers are owned by corporations that have vested economic interests in perpetuating all sorts of injustice, including, but not limited to, animal exploitation, and in keeping discussion focused on the most superficial level so that we avoid discussing the real issues of morality and injustice. That is, the corporate media portray vegans and veganism negatively precisely to deflect attention away from the moral beliefs that most people have. That is, we all think that what Michael Vick or Mary Bale did was wrong, but the media discourage our making the deeper connections between what they did and what we do in our everyday lives. Have you fallen off your chair yet? The “co-option” has already occurred. I wonder what Donald Watson would think about the new campaign. I wonder if he would have been pleased to see his Vegan Society producing these sorts of posters. A common criticism is that the time in not yet ripe for our reform. Can time ever be ripe for any reform unless it is ripened by human determination? Did Wilberforce wait for the ‘ripening’ of time before he commenced his fight against slavery? Did Edwin Chadwick, Lord Shaftesbury, and Charles Kingsley wait for such a non-existent moment before trying to convince the great dead weight of public opinion that clean water and bathrooms would be an improvement? If they had declared their intention to poison everybody the opposition they met could hardly have been greater. There is an obvious danger in leaving the fulfilment of our ideals to posterity, for posterity may not have our ideals. Evolution can be retrogressive as well as progressive, indeed there seems always to be a strong gravitation the wrong way unless existing standards are guarded and new visions honoured. Developed after a long period of research and meaningful dialogue, the campaign shows that we have really been listening to the views of vegetarians and meat eaters. Some people can make the jump to veganism overnight, but we understand that for others, the “Go vegan. Now!” messages are lost. Everyone is now free to embrace veganism, not only those who are already vegan, but those who are thinking about it and want to start bringing more plant-based dishes into their diet, or replace their leather shoes with vegan versions. Vegans can choose from a wide range of different food and products in supermarkets and online. It’s never been easier, in fact. We are not here to tell people what to do or how to live. We are giving people the choice and the chance to join us. We are here to support anyone moving towards a more ethical and sustainable lifestyle. It’s not all-or-nothing. It’s about starting a conversation, or planting a seed. In other words, The Vegan Society was doing a thoroughly incompetent job getting people excited about veganism. Rather than trying to figure out how to reinvigorate Watson’s message of interspecies justice and nonviolence for a new generation and for a world that desperately needs to hear that message, The Vegan Society decided to abandon that message in favor of the idea that if people buy vegan products, it’s all okay. And given that everyone buys some vegan products, The Vegan Society can declare victory, make everyone feel good for buying vegan products, and get donations and bequests of gratitude because the Society is putting its stamp of approval on their non-veganism; on their flexible veganism; on their “vegan consumerism.” It’s all great for the Society’s business and it’s great for consumers who can buy their indulgences for exploiting animals by making a donation. Only the animals lose. Is it hard to educate about morality in 2014? Yes, it most certainly is. But it was also difficult in a different way in 1944, when Donald Watson was trying to deal with these issues in a world that was just emerging from the horrors of World War II, the rise of dictators and tyrants, and the nightmare of the Holocaust. Facebook “likes” on the charity’s page now exceeds 1,000 a week, compared with 100 to 200 previously. But the Abolitionist Approach Facebook page, which promotes veganism as a moral baseline, is at almost 60,000 likes, has gone up about 40,000 in the past year or so, and a big chunk (almost 40%) is the age group 18-34. And not one paid boost. A moment of silence for Donald Watson. That is the least we can do for someone whose progressive vision and message of nonviolence has been betrayed and abandoned. provides no support whatsover for the conclusions that the Vegan Society have drawn from it, that this was made clear to the Society in the strongest of terms several weeks ago, and that their continued references to it are unjustified. At the time, I predicted that the Vegan Society would soon explicitly embrace and promote some version of “flexible” veganism. And that is exactly what they have now done. The Vegan Society is trying to blame those who see veganism as a moral baseline for the failure of the Society to be more successful in attracting new members. No, the vegans were not the problem. The problem was that the Society has lacked creative and dynamic leadership for a while now. I believe that there were some staff in the past who had good ideas but they were stifled by a rather smug and reactionary Council of Trustees. Those staff members are gone. In any event, the Society utterly failed to present the exciting vision that motivated Watson in a way that is relevant for a world that needs that vision more urgently in 2014 than it did in 1944. And now, in a desperate and most cynical attempt to get a greater share of charity donations, the Vegan Society has installed leadership that is overtly hostile to veganism as a moral baseline, and the Society has completely abandoned and betrayed Watson’s vision. I note that the current Chair of the Council of Trustees notes on his bio that he used to work at the RSPCA. I suggest that we have a moment of silence for Donald Watson. And then I suggest that those of us who see veganism as a moral baseline get on with promoting Watson’s message of nonviolence and interspecies justice. Unfortunately, The Vegan Society will not be an ally in that effort. Vegan Society CEO Jasmijn de Boo has issued a statement in response to significant negative reaction that the Vegan Society has received in response to abandoning veganism as a moral baseline. 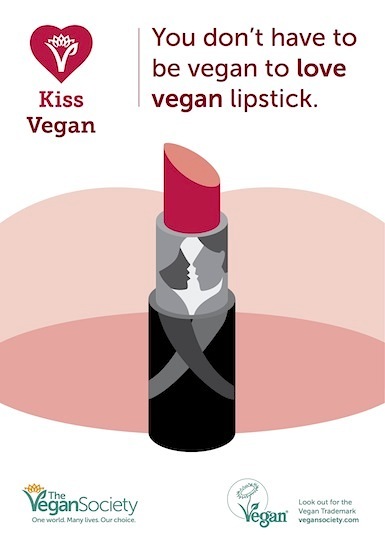 We are aware that there has been some misinformation going around about the Love Vegan campaign and we are monitoring this closely – particularly, the slogan of the campaign has sometimes been partially quoted or taken out of context. We know that we need to be inclusive and non-judgemental if we are going to encourage and support large numbers of people to go vegan and stay vegan. By vegan, we mean vegan, as defined by our founding members 70 years ago this year. We have never and nor will we ever campaign for so-called ‘part-time veganism’ as a permanent lifestyle, but only as part of an exciting journey towards 100% veganism. We know from experience that it makes the whole concept more accessible to everyone – and I’m sure you’ll agree that every step towards veganism, however small, makes a difference. de Boo is merely confirming exactly what everyone is concerned about. 1. The Vegan Society says that it wants to be “inclusive and non-judgmental.” How can one seek to end animal exploitation–or any fundamental violation of rights–in an “inclusive and non-judgemental” way? You cannot take a position that “X is morally right” without taking the position that “Not-X is morally wrong.” Judgment is the essence of morality. In this very statement, the Vegan Society is stating that it rejects veganism as a baseline moral principle. 3. No one ever has or ever will consume only animal products. 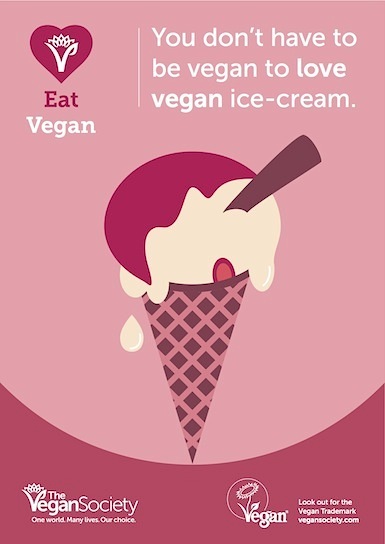 Everyone consumes vegan products at least on occasion. 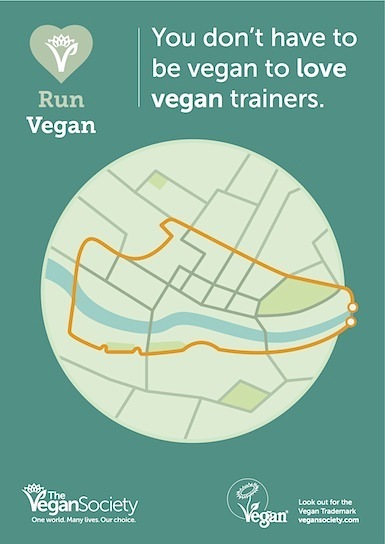 So why is the fact that someone buys a pair of vegan trainers going to lead them to go vegan particularly when the Vegan Society has decided that it will not promote veganism as a moral baseline? How is “vegan consumerism” going to lead to veganism? What “journey” is being referred to? To call this campaign extremely silly is the most positive thing that can be said about it. 4. To say that the current Vegan Society has anything to do with the one that Donald Watson started in 1944 is fantasy and unfair to the memory of Watson. The Society has embraced moral relativism. The problem is that one thing you could say with complete certainty: Donald Watson was not a moral relativist and the Vegan Society of 1944 was not based on moral relativism. 5. It’s interesting that de Boo says that we need to be “non-judgemental” when the Society has, throughout the online discussion of this matter, been characterizing vegans who promote veganism as a moral baseline in all sorts of ad hominem ways. As we receive no government funding, the vast majority of our income is generated by our Vegan Trademark registration scheme. Having more vegan products registered with the Vegan Trademark achieves three things: it gives people more confidence when shopping for vegan products, it shows companies and retailers that the vegan market share is growing, and it funds The Vegan Society’s charitable work. de Boo explicitly confirms what many of us have suspected the new campaign is about: getting non-vegan product manufacturers to pay the Vegan Society to get a stamp-of-approval on some vegan items it may have. And the Vegan Society is reassuring these manufactures that they’re not promoting veganism; they’re just promoting vegan products. The subheadings on our ‘Why Vegan?’ page of our website are deliberately not numbered, but we understand some of the concerns raised about this page. The new website is still being developed, and we know that some of the pages still need revising. So the Vegan Society spent £6000 on the “rebrand,” did all of this “research” and had all of these focus groups, but they just forget to get the website right before the launch? Rather than existing solely to provide information to help individuals become vegans, the society now wants to engage with policy-makers at a higher level on a wider range of issues, such as international development and climate change. The Society made a deliberate decision to move away from the focus on animals. This is not a matter of failing to tweak the website. Statistics taken from a Vegan Society membership survey some of you may have filled in a few years ago revealed that over 80% of our members are vegan for the animals. Most British people currently signing up to our Vegan Pledge project say the same. Compassion for animals is a key motivation for people to go vegan and stay vegan. It’s important that we embrace this in a positive way. Eighty percent of members are in it for the animals. And the Vegan Society decides to abandon the notion of veganism as a moral baseline and to opt for “vegan consumerism,” international development, and climate change? As always, we are open to any practical and positive suggestions relating to our work as a charity, and welcome polite and constructive dialogue on our Facebook page. We accept that we need to make sure our communication is equally respectful, and as stated above, steps will be taken effective immediately to ensure that those commenting on Facebook on behalf of The Vegan Society do so in a respectful and friendly manner at all times. 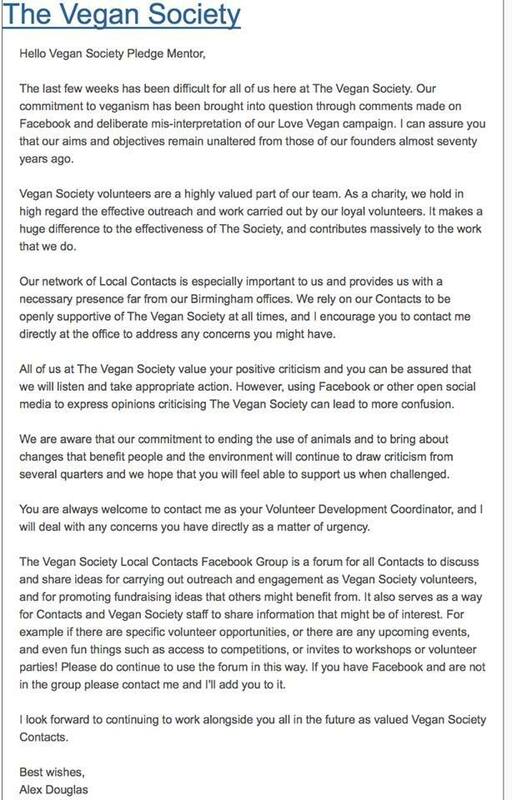 The responses that have been posted on Facebook on behalf of the Vegan Society in response to this new campaign have been anything but “respectful.” Indeed, those who disagree with the new direction of the Vegan Society were subjected to outright name calling. de Boo needs to take responsibility for this and not throw her employees under the bus. She needs to acknowledge that failure to engage legitimate criticism is a policy of the Vegan Society that goes all the way to the top. In 2011 when I raised the issue of the Society taking paid advertisements that promoted and praised non-vegan restaurants, I was perfectly “polite and constructive.” Indeed, I actually took the time to prepare a lengthy memo to address the problem in a most constructive way. I was thanked for raising a “reasonable question” and told that the Council of Trustees was considering my concerns. And then, with absolutely no explanation, I was banned from the on line forum. I never received a reply to my concerns about the matter of non-vegan advertisements and I wrote a perfectly polite note to CEO de Boo on October 2, 2013, asking about how Council decided to resolve the matter. I never received an acknowledgement or reply. Why are people saying that The Vegan Society has “sold out”? “Ambassador” Oakes claimed that promoting veganism as a moral baseline “damages” animals. And, as the essay above demonstrates, the entire rebrand by The Vegan Society is an explicit rejection of veganism as a moral imperative. If there is any “deliberate mis-interpretation” going on, it is on the part of The Vegan Society, which is rejecting veganism in favor of a most flexible form of “flexible veganism” and hoping that the rest of us don’t notice. Second, the claim that their “aims and objectives remain unaltered from those of our [their] founders 70 years ago” is beyond absurd and completely disrespectful of the memory of Donald Watson. Third, it is troubling that The Vegan Society is asking people to not make any public criticisms of its position.